The two cops wrestling with Pongo. 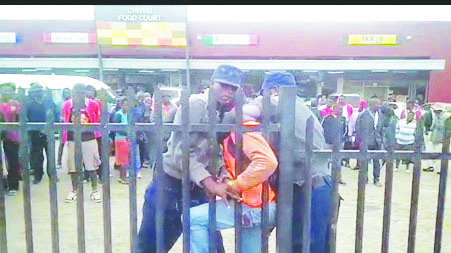 CHIVHU – An airtime vendor who suffers from a medical condition which forces him to vomit each time he is angry or anxious caused headaches for two cops who wanted to arrest him on Tuesday morning. Frank Pongo (19) who is also epileptic threw up into the cops’ faces and uniforms until they were messy and stinking. Dr Alice Kanyemba, the medical superintendent at Chivhu General Hospital confirmed the existence of a medical condition where anxiety and stress could cause nausea and vomiting. Mashonaland East Police spokesperson Tendai Mwanza declined to comment on the incident but said Police was on a mission to rid the town of vendors. There was drama at Chicken Inn in Chivhu as each time a cop moved in to grab Pongo, he poured up with easy into the faces of the Police officers. He would stop vomiting once freed but would throw out again once an officer moved within clutching distance. The two officers had been warned by other vendors not to touch Pongo because of his ‘lethal weapon’. The two officers identified as Gift Chipani and Constable Mbwende eventually won the day but they were sent home on reaching the Police Station because they were too messy to continue with duties. It was out of sheer determination that the officers managed to arrest Pongo. Vendors who spoke to The Mirror said that many Police officers had attempted and failed to arrest Pongo before. Pongo who has speech impairment said he paid a fine of $10 at the Police Station.